Home Purpose of Drilling Machine What is the Purpose and Importance of Drilling Machine? What is the Purpose and Importance of Drilling Machine? The drilling machine is one of the most important machine tools in the workshop. As regards its importance, it is second only to the lathe machine. Although it was primarily designed to make a hole, it can perform a number of operations. By a drilling machine, holes may be drilled quickly and at a low cost. The hole is generated by the rotating edge of a cutting tool known as the drill which exerts large force on the work clamped on the table. 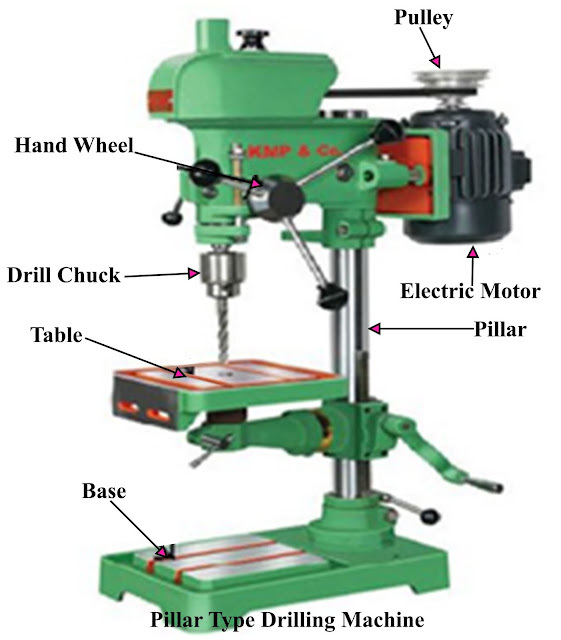 As the machine exerts vertical pressure to originate a hole, it is called a "drill press". Holes may be produced by drilling with twist drill, flat drill, etc., or by boring with one or more single point tools or cutters mounted in a bar or head. Reaming can also be done which is a finishing process. It may be applied to drilled or bored holes to give a better finish. The choice between drilling, boring and reaming depends on several factors, but chiefly on the size of the hole, the accuracy of the hole and the number of holes to be produced. For example, if one or two components are required with an accurately positioned 32 mm hole, they would probably be bored with a single-point tool. But if a large number of such components are involved, they would be drilled and reamed, using a specially designed jig to hold and position the component, having bushes for guiding the drill and reamer to the correct position. Although it is primarily designed to make cylindrical holes, but it can also be used to perform many other operations like boring, counter boring, tapping, spot facing, reaming, bottoming, lapping, grinding, trepanning, etc. It is very cheap, can be installed at any place. Accurate holes and many other operations can be carried out with a minimum expenditure. (a) The portable drilling machines are specified by the maximum size of drill that can be held. (b) Sensitive drilling machines are specified by the diameter of largest work piece that can be centralized under the spindle. (c) Further particulars such as the maximum size of drill that the machine can operate, table diameter, the maximum spindle travel, numbers of spindle speeds and feeds available, Morse taper number of the drill spindle, floor space required, net weight of the machine, etc. are all needed. (d) The size of the radial drilling machine is specified by the diameter of the column and length of the arm. Other particulars such as maximum drilling radius, minimum drilling radius, spindle speeds and feeds, etc., should also be stated to specify the machine fully.